What makes pronunciation difficult for our students? Learning English can be frustrating for our students for several reasons: new vocabulary, different word order, lots of extra prepositions, and, of course, pronunciation! So what makes pronunciation difficult for our students? Well, think of the words: through, though, and tough. Even though they all contain “ough,” what do you notice about the vowel sounds in each? How can we help our students crack this code? Suddenly, with phonetics, we can provide our students the key to unlocking the mystery of English pronunciation! At the beginning, this can look strange to us as teachers and to our students, but after you and your students get used to the sounds of each symbol, phonetics will become an easy shortcut for students to know how they are meant to say some of our most… interesting words. Asthma, laugh, zucchini, rhyme, queue, cough, as well as all of our numerous words that contain silent letters suddenly become less tricky when you can “translate” them into phonetics. Well, depending on the level, there are different ways to incorporate phonetics into the classroom. For A1s and A2s, I like to provide them with a blank version of the phonetic chart which we fill out together as we start to encounter tricky sounds such as /z/ vs. /s/ or /ɪ/ vs. /ɪ:/. For higher levels I provide them with the entire filled out chart from the beginning and refer back to it when problem sounds come up in class. We can also develop an entire class around one or two sounds to really focus on students’ pronunciation. 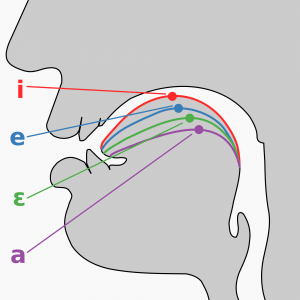 How do we actually teach phonetics? Here I’m going to give you a little taster of ways you can teach a couple of tricky sound pairings for your students. The difference between these two sounds can be difficult, especially for our students who are native speakers of Spanish, as the /ɪ/ sound (think the “i” in sit) does not exist in Spanish. Instead, they tend to use the /ɪ:/ sound (think the “ea” part in read). This can cause a bit of confusion when your student comes back to class after holiday talking about the great cruise sheep they went on. To avoid these linguistic mishaps, I find it useful to bring up the difference between the mechanics of these two sounds. First, have your students place their first two fingers of each hand on the lines that run between their nose and the edges of their mouth (their “smile muscles”). Have your students say the word “sheep,” elongating the /ɪ:/ sound. They should notice that the muscles their fingers are placed on move back towards their ears. Next, have them say the word “ship.” Here those same muscles shouldn’t move. Have your students repeat the words one after the other, so they can notice the difference. Now, whenever your students have trouble with a word with the /ɪ/ sound, you can remind them about the lack of movement of those smile muscles and this will help them keep that sound short and relaxed. Here is where the difference between voiced and unvoiced (or voiceless) sounds comes in handy. First off: what does a sound being voiced or unvoiced mean? This has to do with the vibration or lack of vibration of your vocal folds (or chords) when you make a sound. Start by placing your hands flat against either side of your throat. Make the /s/ sound (like the “s” in the word six). Now make the /z/ sound (like the “z” in the word zoo). What do you notice? You should feel a vibration in your throat when you make the /z/ sound. The mechanics of making the two sounds are exactly the same, except that with the /z/ sound, the vocal folds vibrate. In class, have your students perform that same exercise, first making the /s/ sound, and then making the /z/ sound. I find it sometimes helps to have them repeat the sound a bee makes if they have trouble initially creating the /z/ sound. Once your students are familiar with the difference in vibration between the /s/ and the /z/ sounds, whenever they come to a word that needs the /z/ sound, you have an easy shortcut to get them to make the sound by asking them place their hands against their throat to notice the vibrations. And voilà! Now you have a couple of handy tricks for two extremely common pronunciation mix ups that will help your students to improve their pronunciation.